A couple decades ago, no one would have considered it, but one of today’s most popular flooring products is bamboo. 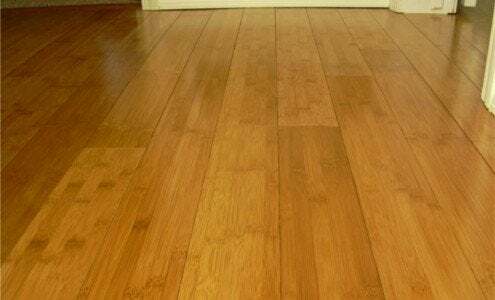 Anywhere you’d use tongue and groove hardwood flooring, you can use bamboo. It’s not recommended for really wet areas like bathrooms, since standing water can swell it like any wood, but it cleans up the way you’d clean a hardwood floor, with a damp mop. And it can cost twenty-five to fifty percent less. The new strand-woven bamboo flooring is specially laminated to be harder and less prone to scratching and damage from, say, high heeled shoes. And carbonized bamboo flooring undergoes a coloration process that gives it a darker, more mellow color. Many brands are pre-finished with a durable aluminum oxide finish and warranted for ten to twenty-five years. It’s beautiful and exotic, but the main reason bamboo flooring is so popular is that it’s so rapidly renewable. Bamboo grows like grass; as soon as it’s harvested, more starts growing. Where hardwood takes decades to mature, bamboo grows two feet a day: the fastest-growing plant on the planet!